Button Down Service. The Jack Brown Way. Free Pickup and Delivery: Bringing outstanding Jack Brown service to your home or office. Even if Elvis were to suddenly appear at one of our locations and need some work done on his blue suede shoes, we could do that. Tablecloths & Linens should always be cleaned before storing. Bring yours to Jack Brown Cleaners and we will get your tablecloths & linens ready for your next gathering! To look your best, we starch and crisply press shirts and pants. Your garments will be presented meticulously hand finished. No matter what you do, you’ll look good doing it. Bring in your laundry to Jack Brown Cleaners and see for yourself. Whatever your reason, we can take care of your garment alterations at all of our locations. We understand there often aren’t enough hours in the day to get your work done and take care of your personal errands, too. That’s why we offer 24-Hour Service Centers where you can drop off and pick up your cleaning, whenever it’s convenient for you. It’s as easy as JBC. Way back in 1935 when we started, we found out that if you want to take care of Texans’ clothes, you better be able to clean leather and suede. So we do. Everything from belts, skirts, purses, pants, gloves and Ugg-style boots to chaps and Wild Bill Hickok replica fringe jackets. Bring your leather good in to a convenient Jack Brown Cleaners location today and we will take care of it! Even if people went a little wild with the rice at your reception, we can get your wedding gown looking picture perfect again. Jack Brown Cleaners would love the opportunity to earn your business. 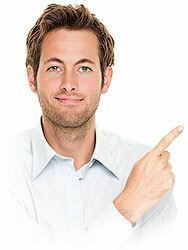 We would be honored to be your dry cleaning preference and will treat you like family. Speaking of family, we are family-owned and operated and have been a fixture in Austin and Central Texas since 1935. 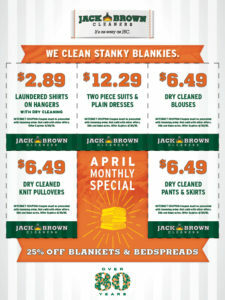 Don’t store your stuff dirty, have Jack Brown clean it first! Are your clothes being squeezed into your closet between a bunch of empty hangers? Take a few minutes and clean out the unused hangers and marvel at all the extra space you will have. Drop your hangers off during your next trip to Jack Brown Cleaners and we will recycle them. We also recycle the plastic used to protect your dry cleaning, so be sure to ball it up and drop it off with your used hangers. Together we can do our part for the environment!